I painted this from the sidewalk on the Ku'damm in Berlin. A little gypsy boy stopped by to complement me, and, as he did so in a very charming and winsome way worthy of the Dodger, tried to pick my pocket. I didn't realize that's what he was trying to do until later, and fortunately kept my valuables in a cloth holster under my shirt, because otherwise that cute little refugee would have made off with everything. I didn't see him when I came back the next day to finish the painting. 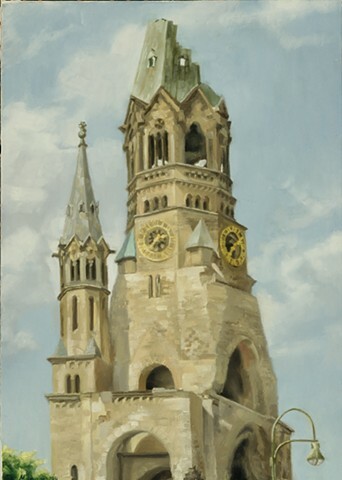 When I finished it, a German who spoke excellent English stopped by to say he could tell how much the building meant to me and how much I loved it, and he could tell my history had intertwined with Berlin's because the painting expressed such a strong feeling for the city. The man sat down on a railing by a phone booth to tell me these things, and then tell me how moved he was by the painting. "But I won't buy it!" the man said. "No, I won't buy it because the painting needs an audience first and people need to see it." Those are the moments I live for as a painter.